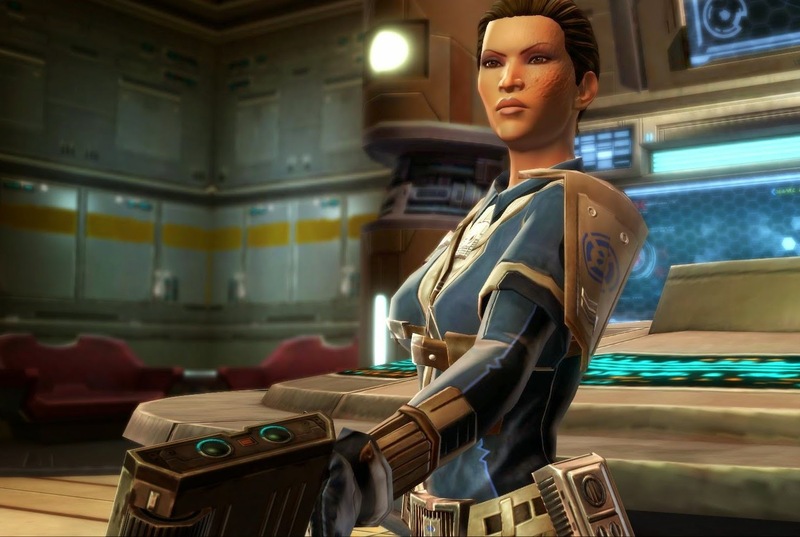 Going Commando | A SWTOR Fan Blog: Macrobinoculars and Seeker Droids - Where Should They Go? Macrobinoculars and Seeker Droids - Where Should They Go? First off, I have to say that Macrobinoculars and Seeker Droids are annoyingly long words with no real synonyms, so it's quite hard to come up with a good title for a post about them that is informative without sounding too clunky. I'm not sure I succeeded in this case. Either way... while thinking about what I liked about Rise of the Hutt Cartel and which features that came with it I'd like to see return in the next story expansion, Macrobinoculars, Seeker Droids and everything associated with them gave me reason to pause. Basically, I previously rated them as pretty nice additions to the game, and I had a ridiculous amount of fun with the heroics that finish off the Shroud and Dread Seed quest lines, at least the first time I did them. But looking at them now, I feel that they are in a kind of awkward place, and I'm not even sure what I'd want Bioware to do about it. Basically, when 2.0 came out, both Macrobinoculars and Seeker Droids were pretty self-contained pieces of gameplay. You did the associated quest chains because you wanted to see the story and to unlock the GSI dailies, but if you didn't care about those particular pieces of content, you could take them or leave them. While I seem to recall some non-GSI dailies on Makeb using Macrobinocular-like mechanics, they didn't actually require you to have started the Shroud quest chain, as you were issued a mission item which basically did the same thing as the binocs just for the duration of the quest. But with the release of CZ-198, something interesting happened. In Czerka Corporate Labs, during the first bit where you need to gather some key cards, you can whip out your binocs to immediately spot in which cubicle each card is hidden. I rarely see anyone bother with it since it barely saves you more than a couple of seconds compared to just checking each desk the "hard" way, but it was an interesting touch to add that. 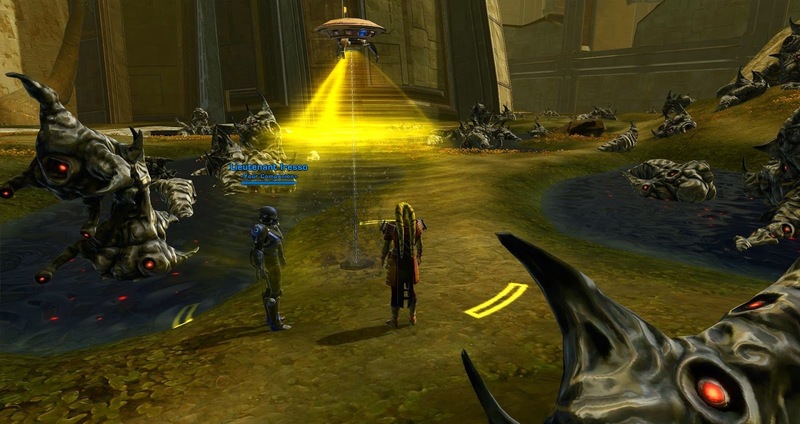 In the daily area, Bioware also hid a "secret" quest chain that required you to use your Macrobinoculars to even activate it and which rewards you with a pet if you complete it. On Oricon, this was taken a step further in that several of the dailies have bonus missions which can only be done if you've got Macrobinoculars and a Seeker Droid on that character. Now, part of me thinks that's very cool. It shows that Bioware didn't introduce these things as new features with Rise of the Hutt Cartel just to immediately forget about them again - something that is sadly pretty common in MMOs - and that they are trying to integrate them more closely into "regular" gameplay. The only problem I have in this case... is that I'm not sure I want these things to be part of my regular gameplay. You only really need to do the introductory quests for both the Shroud and the Dread Seed story to unlock the binocs and Seeker Droids for use in other areas, but then you've got two unfinished quest chains sitting in your log. I don't know about you, but personally I hate that. I don't have to do everything on every character, but if I'm going to skip something, then I'm going to skip it entirely. I hate starting something and then abandoning it halfway through. So once I've picked up the Macrobinocular and Seeker Droid quest chains, I'll want to finish them... but they are really long! And at least one of them has a "must have exactly four people for this" heroic at the end, which is a royal pain to get a group for! Basically, they are the types of quests that are great to do once or twice but get incredibly tedious if you repeat them on several characters. Yet the more random content Bioware adds which requires you to have picked up these chains, the more the pressure increases for you to indeed pick them up on all your alts, even if they are annoying to do. It's a bit of a "damned if you do, damned if you don't" situation in my eyes. The sad thing is, I really have no idea what could be done to improve this situation. Just not adding any more content for these features, ever, would be a bit sad. Yet at the same time I feel that they have a pretty annoying "attunement" for something that you might be expected to have on all of your alts, especially since you can't get started until what, level fifty? Fifty-three? In some ways I can't help but think that these chains would actually make for pretty good levelling content, what with all the travel across levelling planets, but unfortunately the fact that there are pretty explicit references to Makeb and the Dread Masters in the story means that Bioware can't just lower the required level for the quests without muddling up the timeline. I suppose part of what it comes down to is how fun you consider using your Macrobinoculars and Seeker Droid. If they offer compelling gameplay, then of course there should be more of it, and having to do a lengthy quest chain to fully unlock both features should be no trouble at all. Personally I'm afraid I don't really enjoy them that much though. I stand by what I said about them being neat little mini-games, but... well. I loved using the binocs during the story quest line, to explore my environment and find solutions to overcome the obstacles in my way, but that kind of exploration only really works once. Scanning the same stuff over and over again for the dailies hasn't felt very compelling to me personally. And Seeker Droids? I'm a little ashamed to say that to this day, I don't really "get" them. I mean, I get the principle behind how they work, but I remain ignorant of the details. For example, when the little circle pops up to show me which direction I should go to dig more, is that from where my character is standing or from where I put down the droid? I often feel like I'm "following" the trail correctly but somehow I just end up going in circles without finding anything, or I suddenly find myself in an area where the guiding circle just goes red (even though a moment ago it told me to go just this way, I swear). I don't really know many people that bother with the random dig sites, though my dear friend Mogle baffled me the other day by casually mentioning that, while using his Seeker Droid to dig up the full Dread Seed armour set, he had accumulated something like 24 bracers and 37 belts. My mind boggles at the mere idea of how much time he must have spent digging, but clearly there is a part of the player base that does enjoy this kind of thing. What's your attitude towards these features, nearly a year later? The direction is from where the seeker droid is digging. What I tend to do is launch the seeker droid and stand right underneath it. That makes it easier for me to tell where to aim the next try. Also, I tend to use the consumables to make it easier to find things. Any idea how well or badly these two systems work multiplayer? Do the stages of the missions complete for all players or do you have to do them individually? How about the seeker droid, will it scatter the group randomly over the zone? At present only I have access to the Hutt expansion, but when our leveling trio reaches 50 we'll have to decide whether to do the expansion first or to start leveling a new group instead. They work fine; credit is always shared (as long as you're within minimum range). With the Seeker Droids, you can even "double tap" some objectives (get credit twice if you both use your quest item at the same time), which can speed things up quite a bit on some missions. At the very least, I think they should remove/change the final forced-group quest in these chains to be solo. Unless you have kindly guildmates, no one ever needs to do them or wants to do them. As much as I love heroics, I'm inclined to agree on this one - if nothing else, they could at least nerf it down to a heroic 2 (like they have done previously when certain heroics became less popular, see Belsavis dailies), as finding a single helpful soul is a lot easier than finding a full team of four to click all the buttons. I think I'll have to get back to you on that, because I've never finished either questline completely. The closest I've gotten is to getting to the Heroic-4 for ilum for the Seeker Droid on my Sorcerer, but I've not gotten over to ilum yet to actually do that Heroic yet.